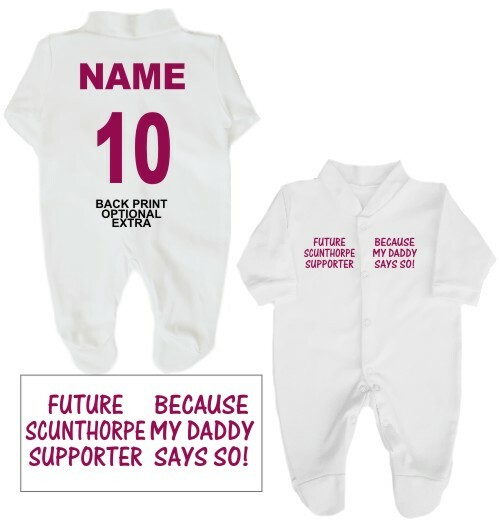 This 100% cotton babygrow is perfect for the newest Scunthorpe member of the family. This white babygrow is printed with on the front with Future Scunthorpe Supporter… Because my Daddy Says So! If you prefer Daddy can be changed to another name such as Mummy, Grandad, Uncle, Brother or cousin etc. If you wish to do this just enter the name in the text box below. The babygrow shown above is printed in burgundy or pink for a baby girl. As an optional extra you can have this item personalised with a name and number of your choice on the back. Just like the professional footballers!